With a Linksys cloud account, you will be able to access and configure your router anytime, anywhere. This article will show you how to set up the Linksys cloud account using a Mac® computer. NOTE: You should also connect the power adapter of the router to the Power port then plug the other end to an available wall socket. Access the web-based setup page of the router starting by opening any web browser. Enter the default IP Address “192.168.1.1” on the Address field then press the [Enter] key. A pop-up window will appear, asking for your router’s username and password. Enter “admin” on both fields then click OK. You will be redirected to the web-based setup page. On the web-based setup page, click the Wireless tab then click the Manual radio button. 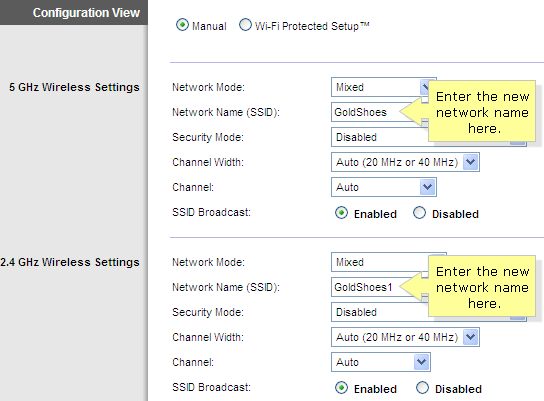 Enter a new network name on the Network Name (SSID) fields found under the 2.4 and 5 GHz Wireless Settings section. Click Save Settings to apply the changes. On your web browser, open a new tab then go to the product page of the router that you are using. In this example, we will be opening the Linksys Smart Wi-Fi Router, EA4500 product page. NOTE: The specific product pages for the routers that you are using can be found in the Linksys Support Site. 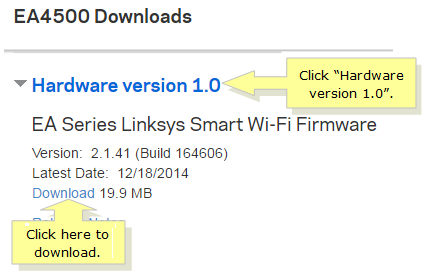 On the Linksys Smart Wi-Fi Router, EA4500 product page, click on DOWNLOADS / FIRMWARE. Click on the hardware version then click the link to download the utility. NOTE: It is recommended to save your downloaded file on the Desktop for easier access. Open the upgrade utility file then follow the onscreen instructions, as seen in the images below. The last window for the setup will inform you that the process has been completed. Click the Launch Linksys Smart Wi-Fi button to proceed. QUICK TIP: Take note of your router and wireless settings. 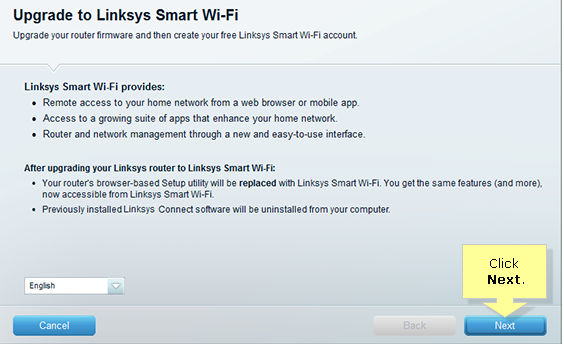 You will be redirected to the Create a Linksys Smart Wi-Fi Account page. Fill out the required fields then click Create My Account. 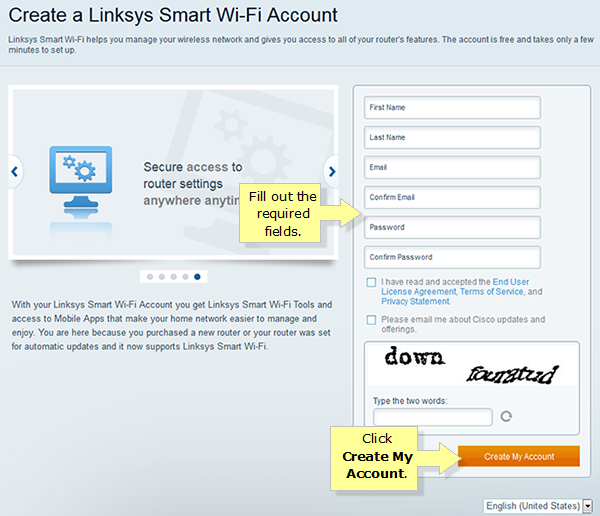 Click here for detailed instructions on how to create, activate and associate an account with Linksys Smart Wi-Fi. 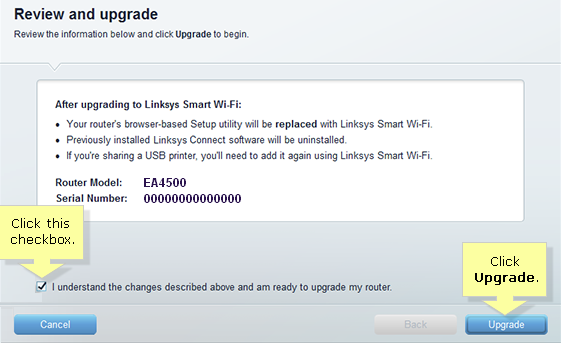 After logging in using your Linksys Smart cloud account, you will get the Associate Router prompt. Enter your router's admin password. The default password is "admin." Congratulations! You have now successfully set up a Linksys cloud account on your Mac® computer. You can now start configuring various settings on your router. Make sure to prioritize settings such as wireless security to ensure that your network is protected against unwanted intruders. Click on the article below for instructions on how to do this. IMPORTANT: Once you have completed the setup for the Linksys cloud account, a shortcut icon will appear on your Desktop. Click on this icon for easier access to your Linksys cloud account.